The AMK DT64-C loudspeaker is powered by a POE+ network amplifier with Dante™ input. It is a 2x2 lay in grille speaker system for easy ceiling tile installation. No external power supply is required. The speaker system has a Class D amplifier which provides efficient use of power. The assembly comes with AMK's CX 602, highly efficient coaxial loudspeaker. This system will solve the issue of having to provide a separate amplifier or I/O interface for speaker installations. 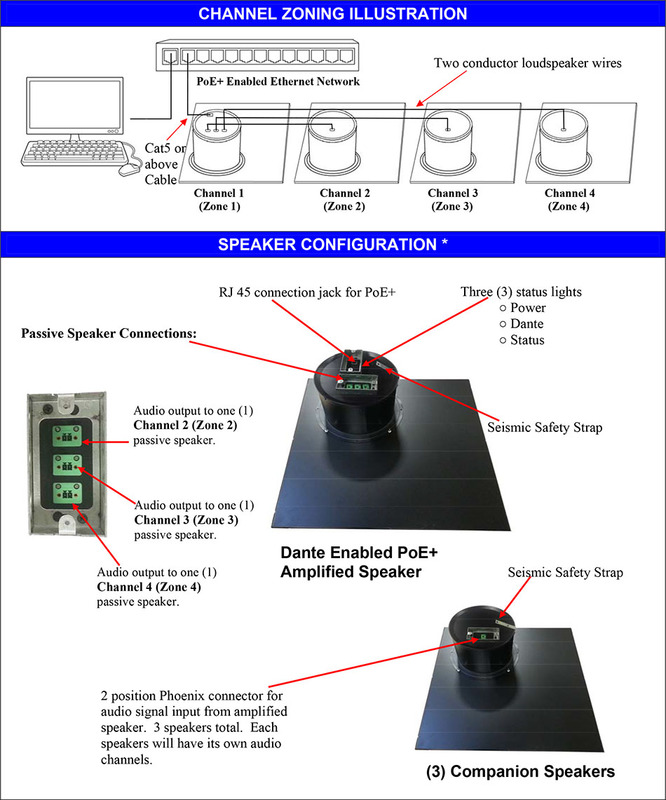 One PoE+ amplified speaker can power a total of (4) speakers, including (3) additional passive speakers, with one separate audio channels for each speakers. The CX602 loudspeaker driver has excellent dispersion, wide bandwidth and a smooth frequency response which makes this the top choice for today’s overhead commercial applications. This assembly can be used in wide range of projects for paging and background music applications. The DT64-C is ideal for hotels, education, hospitals, retail stores, performing art centers, restaurants, airports, houses of worship, and board rooms. The end users will appreciate both the sound and visual quality of these speakers. * PoE+ powered without a need for local power. * RJ45 connection for audio from PoE+ Ethernet. * Weather and water resistant.